Minnesota ophthalmologists are among the best in the world, contending with the most complicated and challenging eye health issues. Their work includes surgical treatments for cases of glaucoma, cataracts, conditions of the retina, eye cancer, corneal disease, and more. With the aging of the American population, demand for the medical and surgical expertise of ophthalmologists will increase more than 33% in the next five years. In addition, innovative new treatments now under development are also increasing the demand for specialized eye surgery. University eye surgeons have no surgical suites specifically for eye surgery on the University of Minnesota campus and have been performing surgeries in shared space at the Phillips Eye Institute or Fairview Hospitals, using borrowed equipment. This causes delays in getting patients the care they need. As surgical demands increase, the problem will worsen. The Minnesota Lions Eye Surgery Center will fill a critical void, and the patients who benefit from this improved service will once again owe a debt of thanks to the Minnesota Lions. Contribute to the Lions Eye Surgery Center Campaign. 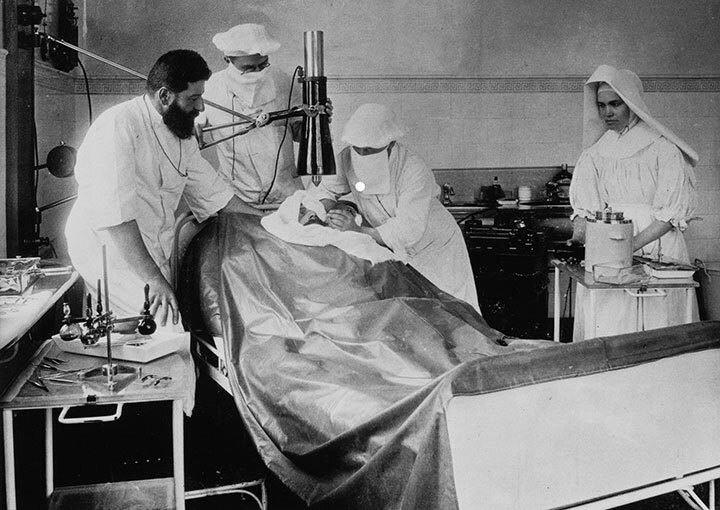 In 1905, Dr. Eduard Zirm (pictured here) performed the first successful corneal transplant in what is now the Czech Republic. We’ve come a long way!